(Abuja, January 30, 2019:) Ministers tasked with gender and children affairs from the Economic Community of West African States (ECOWAS) Member States have made a common position against child marriage in the region. A release from the Liberian Embassy in Abuja, quoting a communication from the ECOWAS Commission’s Communication Department in Abuja, says the ministers also made a political declaration during a one-day ministerial meeting held last weekend in Abuja, the Federal Republic of Nigeria. 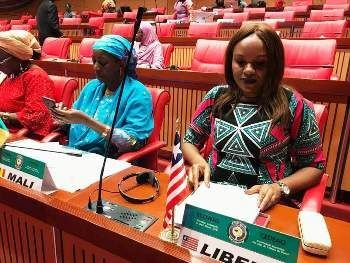 According to the Liberian Embassy release, Liberia’s Deputy Minister for Gender and Child Protection, Mrs. Lydia-Mai Sherman, and her West African counterparts witnessed the adoption of the ECOWAS Child Policy and its Strategic Action Plan (2019-2023). In order to ensure that the rights of children are protected, the Ministers also stressed the need for cooperation on all levels (regional/national) to mobilize financial and technical support for planning, implementing laws and policies, monitoring and evaluation, as well as accountability for measures taken to end child marriage, the release quotes the communication as saying. For her part, ECOWAS Commission’s Commissioner for Social Affairs and Gender, Dr. Siga Fatima Jagne, in her remarks during the meeting, reiterated the Commissions’ commitment to prioritizing, mobilizing and allocating the necessary resources to address the multi-faceted issues affecting children in West Africa. The Commissioner stated that child marriage is a good example of problems that persist in West Africa: “Available data shows the prevalence of child marriage in ECOWAS to be about 42% among girls and three percent among boys”, she said. Also making remarks at the ministerial meeting, the representative of the United Nations International Children's Emergency Fund (UNICEF) Mohamed Fall enthused that with the adoption of the ECOWAS Strategic Framework for strengthening child protection systems and the update of the ECOWAS Child Policy, ECOWAS is emerging at the forefront of African institutions that promote and protect the rights of the child. The ministerial meeting ended with the ministers adopting the reviewed ECOWAS Child Policy and Strategic Action Plan and the roadmap on prevention and response to child marriage which will be submitted to Council of Ministers and subsequently to ECOWAS’ Authority of Heads of States and Government for approval, the release concludes.